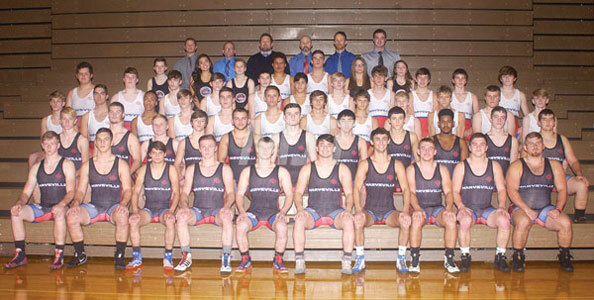 Members of the Marysville High School wrestling program are from left, front row, Dex Coffey, Logan Painter, Michael Jones, Blayne Landon, Jaimeson Bigler, Zach Lowe, Cole Hosterman and Ethan Smegal; second row, Garrett Seger, Jagger Snyder, Lincoln Heard, Nathan Thompson, Parker Reese, Grant Marshall, Logan Hawn, Payne Miller, AJ Bibb, Chris Lambert and Joey Palmer; third row, Tyler Winfield, CJ Grose, Tracen Cooper, Alex Reveron, Max Shroyer, Anthony Coy, Bryce Thomas, Joey Elay, Lincoln Witt, Riley Miller, Andrew Bentz and Nathan Francis; fourth row, Tyler Yates, Jack Blumeberg, Harley Crouso, Austin Winn, Aubrey Romine, Emilio Guerrero, Josh Melms, Brendon Kovinchick, Jack Golla, Brady Miller and Richard Nielsen; fifth row, Zoey Tornberg, Laila Oribello, Emma Swart, Jerry McNeil, Erryl Will, Emily Segner and Madison Sharp; back row, coaches Curtis Thompson, Ivan Mullett, Shawn Andrews (head coach), Tim Crane, Nate Andrews and James Stodart. For a program that has been blessed to experience far more peaks than valleys over the years, the 2018-19 campaign is going to be a season of unknowns for Marysville High School wrestling. Due to numerous season-ending injuries and graduations, the Monarchs have only four starters back from a squad that finished second to Dublin Coffman in the Ohio Capital Conference’s Central Division. A pair of mainstays for the team will be seniors Walker Heard and Logan Painter. Heard will wrestle at either 152 or 160 pounds, while Painter will hold down the spot at 195. Classmate Ethan Smegal will compete at 220 once he has been cleared appendicitis surgery. Cole Hosterman, another senior, is set at 132. Senior Mike Jones is attempting to come back from an injury in order to compete at 132. His return, however, is very questionable for the upcoming schedule. Senior Jamieson Bigler, another veteran, is out of the season after suffering an ACL injury. Heavyweight Tyler Connolly, who was the top returning Division I athlete in that category, is also out for the entire season after shoulder surgery. “Injuries and graduation have taken their toll,” admitted Monarch head coach Shawn Andrews. There are a number of athletes who are competing to fill positions. They include seniors Zach Lowe (170-182), Joey Robinson (152-160) and Payne Miller (126). The Monarchs, though, will be without Miller’s services for about four weeks as he nurses a hand injury. With so many injuries, MHS will have to rely on several athletes who don’t have an over abundance of varsity mat experience. They include, among others, Dex Coffey (182) and Grant Marshall (170-182). “On the plus side, we have 23 freshmen and it’s going to be exciting to see what potential they bring to the program,” said Andrews. The Monarchs may especially feel that inexperience at what the coach calls the “bookends” of the lineup with Lady Monarch Madison Sharpe at 106 pounds and first-year grappler Tyler Yates at heavyweight. The Monarchs posted a 4-1 record in the OCC Central Division while finishing second behind Dublin Coffman. They won sectional and regional championships and finished as district runner-up. Andrews feels the Shamrocks will once again be at the top of the divisional title. Just where the Monarchs may finish in the conference is very much up in the air with so many question marks. As far as season goals, they haven’t changed despite the roster depletion. “We always focus on the end of the regular season,” said Andrews. “We always want to win the district championship and finish in the top 10 as a team in the state.